For a vast majority of people Christmas poinsettias are a disposable commodity. There are a few of us however, who adopt them as part of our permanent plant collection. A while back, for several years in a row, I kept one particularly bright red poinsettia that eventually grew to almost four feet tall. You can imagine it was pretty impressive at Christmas time while in full bloom. Unfortunately, I don’t have any pictures of it to share with you. The computer I was using at the time crashed and took all of my plant photos with it. I learned a hard lesson that day. To keep your poinsettia going for as long as possible, keep a couple of things in mind. Most poinsettias die from over-watering and that is related to growing conditions. Your home probably has a lower quality of sunlight than the greenhouse from which it came, so your plant will be less actively growing and therefore need less water. So, let the soil dry out some before watering. Then water the plant thoroughly until water flows out of the bottom of the pot. Pour out excess water after every watering. Most poinsettias come with a waterproof foil or plastic wrapper to keep water from leaking onto furniture. 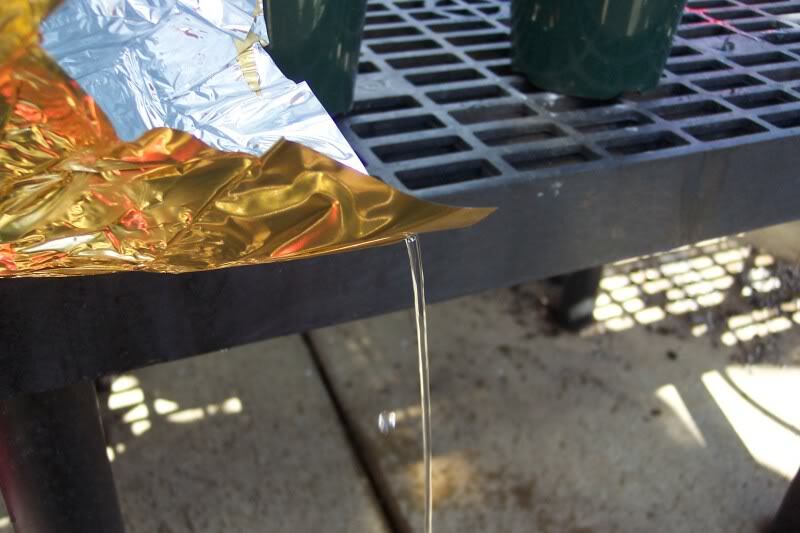 After watering, dump out any water that remains in the wrapper. It is this extra water held in the foil that is the main reason poinsettias die prematurely. Poinsettias standing in water develop waterlogged roots. Eventually the roots begin to rot and the plant rapidly declines. Don’t worry about fertilizing your plant, it won’t really need much until spring. A half-strength dose of water soluble houseplant fertilizer once in a while should be more than adequate until growth resumes in the spring. Also, bear in mind that poinsettias weren’t meant to last too much longer than the Christmas season. They were bred for color, not hardiness. On the other hand, I’ve seen some poinsettias growing under abysmal growing conditions that survived until spring when the owners set them out in the sunlight to grow again. At the very least, enjoy your poinsettia as long as possible this winter as a reminder of wonderful Christmas memories. During many winters we have a January thaw. We had a very welcomed warm spell last week and it looks like there will be another warm-up this week too, even though it may not be quite as warm this time around. I always like to take advantage of those warm mid-winter days to freshen up my house plants and others that I have growing inside. Three of my citrus trees, which are about six feet tall including the pot, share space in a southern window in my woodworking area. That means their leaves are often covered in fine sawdust depending on the project I’m working on. I recently finished a project that required quite a bit of sanding which developed a lot of sawdust that settled on the citrus tree leaves. Last week’s thaw gave me the opportunity to haul out my two wheel hand-truck and wheel out the heavy potted trees out to the driveway. I didn’t need to hose off the plants because of the drenching rain that came later in the day. That rain was all that was needed to get them clean. Since then however, I’ve generated more saw dust and they’re all dusty again. 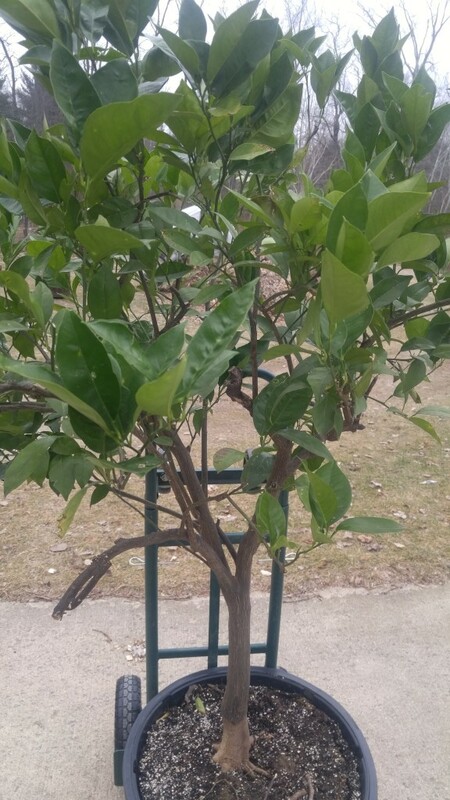 My 17 year old citrus trees have been rinsed off every January thaw. The good news is that temperatures are predicted to be near 50 degrees F during the next couple of days. That’ll be the the perfect time to wheel them back out and rinse them off again, only this time I’ll have to drag out the hose. Some of my larger house plants are going to get a good outdoor rinsing too. This mid-winter rinsing not only washes off dust but even more importantly, it removes many of the small insect and other pests found on indoor plants such as spider mites, mealy bugs and scale. The population of those types of pests can build up to a damaging level inside a warm, dry winter environment like we have in many Michigan homes this time of year. Rinsing with water knocks back the insect population to a tolerable level. 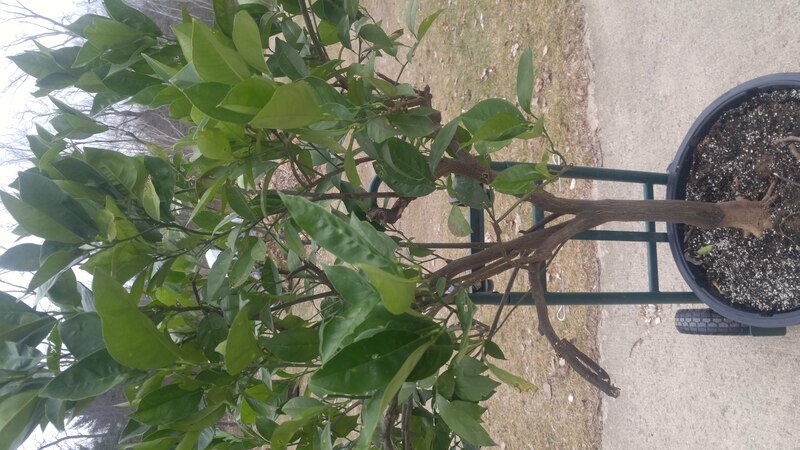 Mature citrus tree leaves are tough and can handle strong streams of water. Other plants though have more tender leaves which can be bruised by a too vigorous spray from an exuberant gardener — I know, I’ve done it. If you plan to do a mid-winter rinsing, I suggest you start with a fine spray and increase the pressure if needed. You’ll have to use your best judgement as you go along. I use a three-hole nozzle that puts out a very fine, yet strong stream of water that knocks off just about everything without damaging leaves. Be sure to spray the under-side of the leaves. That’s where the biggest concentration of pests will be hiding. Just about every year, going into winter, I have perennials or other potted plants left over from the growing season that never got planted for one reason or another. I usually have plans for them so I like to keep them over winter. It’s a good idea to keep plants out as long as possible in the fall. An occasional short cold snap doesn’t bother the plants at all. This year the mild fall weather lasted so long that I just now got most of them put away into their winter storage spots. The most valuable plants I worry about are my bonsai. They are several years old, my false sequoia is well over 20 years old. All the bonsai are hardy trees that require a cold dormant period to complete their annual life cycle so have to be kept outside during the winter. There’s a spot under my mature pine trees where the bonsai spend the winter. There I dig a hole and place them in the hole on their sides. 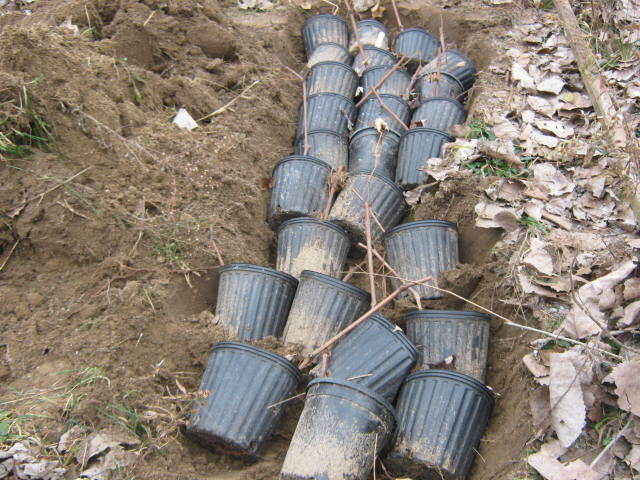 Placing them sideways keeps snow melt water (which we get sometimes) from accumulating in the pots. That reduces the chance that the terracotta pots will crack when the water re-freezes. Soil excavated from the hole gets banked up over the pots and the crown of the trees. I then rake plenty pine needles over the tops to insulate them from the cold winter temperature and wind. The entire storage area gets covered with a tarp or other kind of covering. I put the rest of my perennials in various places around my property. I have a number of left over grape cuttings that I rooted this spring. Those I tucked away in a well-drained spot in the vegetable garden. A few miscellaneous perennial flowers are mixed in there with the grapes. A few years back I had some potted elderberry plants that I overwintered in the ground. I buried the pots as usual but put them in a new place, somewhere way out of the way. When spring arrived I was so busy that I forgot I even had elderberry plants. It wasn’t until late June that I saw a group of elderberries growing out of the soil that I remembered I stored them there the previous fall. I learned how a squirrel feels when it forgets where it buried its acorns. Some weather forecasters are predicting another polar vortex may be taking shape again so it’s time to finish up getting those plants into the ground. I’ve been growing Elephant ears — Colocasia esculenta — for many years. Over that period of time I’ve rarely had them bloom. They just don’t set flowers very often. Normally when plants blossom, it means they are all set to produce seeds. Colocasia, however has been cultivated for so long, that it no longer is able to produce seeds and relies on people to reproduce. In tropical regions, people plant the underground corms like we would plant a flower bulb here in Michigan. Colocasia is a dramatic addition to the landscape with it’s huge leaves that easily grow to three feet long in Michigan. In it’s native area in the tropics the leaves can measure six feet in length. People in the tropics don’t grow them for their landscape, instead they eat them. There, colocasia is called taro and is a major food crop where it is used like we use potatoes here. Millions of tons of taro are harvested each year. One winter, many years ago, I had a recent immigrant from the south Pacific visit the greenhouse where I was growing dozens of colocasia in pots getting them ready for planting out into the landscape. She recognized them immediately and asked me if I was growing them for harvest. I told her they were for planing out in the landscape as a decorative plant. She laughed and thought that was quite funny! 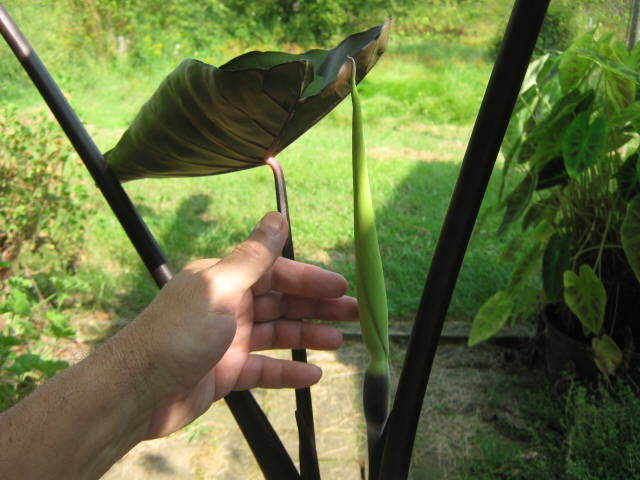 This is the second flower bud on this colocasia plant. My blooming colocasia was one that I stored in my semi-heated garage over winter. I kept it in its pot and let the soil dry out. I watered it once in a while. The plant went dormant and was exposed to some cool temperatures for extended periods of time but it never got much colder than the lower 40′s. The only light it got was low, indirect sunlight from a small garage window. I have a theory that stressing the plant somehow triggered a flowering mechanism. The other colocasia I had bloom was about 12 years ago and that plant was stored over winter much the same way. I’d be interested to hear if any readers have had similar experiences with their colocasia. Recently I’ve had three people ask me about caring for their Sansevieria. I took that as a sign that there may be a few more people wondering about the same thing. Sansevieria, commonly known as mother-in-law’s tongue or snake plant, are probably the most common plant found in people’s homes. I suspect the reason for this is because they survive long after other plants have died from neglect. Therein lies the secrete to keeping a Sansevieria: benign neglect. Most plants die fairly quickly if neglected. Not so with Sansevieria. 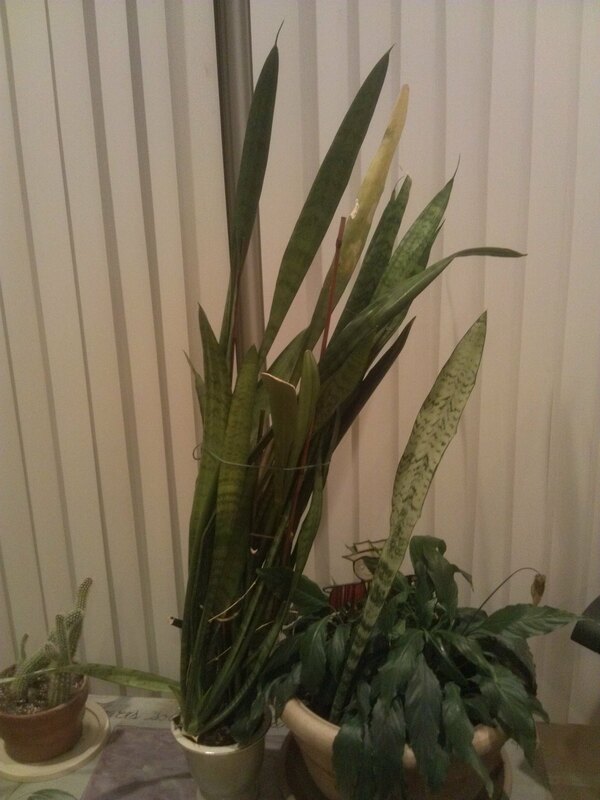 Whenever I see a snake plant that has problems, most of the time it’s because its owner watered it too much. During this time of the year watering about once every three weeks is plenty. Water a little more frequently if the plant is in a bright window or greenhouse, a little less if it is in a darker area of the house. Although they can survive under almost any kind of lighting conditions, full morning sun will help your plant thrive rather than just survive . Continuous bright but not direct light is just as good. I kept one in a bright foyer area for years and it was quite happy there. If your plant’s leaves are flopping over, it may be a sign of too little light. Mother-in-law’s tongue plants do well when their roots are crowded. Note the small size of the pot. Sansevieria grow under a wide temperature range too. So if you are competing with your most energy efficient neighbors to use the least amount of energy during the winter, don’t worry about hurting your Sansevieria by turning down the thermostat too much, it will do fine in cool, but not cold, conditions. From my own experience I would caution you not to leave your plant in a drafty place when the temperature might go below 40°F for any length of time — low temperatures will cause chilling injury. Because Sansevieria are grown for their foliage and rarely flower, some people think they are dull and boring. If you are in this group, think about this: NASA scientists have found that Sansevieria has the ability to clean significant amounts of formaldehyde, benzine and other toxic chemicals from the air. So, they’re really not so boring after all. Fortunately for those who have pets or small children, Sansevieria are non-poisonous however they may cause skin irritation.